Muddy Waters’ role in the evolution of blues music cannot be over-stated. 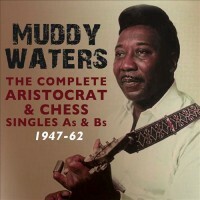 His seminal influence is distilled and chronicled in these four CDs, which include all of his singles (78’s and 45’s) released by the Chess brothers’ companies from 1947 through 1962. Though audio quality varies, this set is worth the low price if you don’t already own copies of these songs. Born McKinley Morganfield, Muddy Waters learned to play blues from Son House, and his music was directly descended from Charley (Charlie) Patton, Son House and Robert Johnson (another Son House student). In his early sides, for Leonard Chess’s Aristocrat Records, Waters played an electrified version of the sparse country blues he learned on the Mississippi Delta. Often accompanied only by an acoustic bass, played slap-style, Waters’ strong voice and confident slide guitar are the featured sounds. His lyrics are variations of the same rural blues themes he took north to Chicago. His first song to gain traction, “I Can’t Be Satisfied,” was the A-side of his second Aristocrat single, released in 1948. “Rollin’ and Tumblin’” parts 1 and 2, released in 1949, is also in the minimalist, electrified-country style. In 1950, harmonica ace Little Walter Jacobs joined Waters’ recording band, adding a gritty and sometimes manic element to Muddy’s evolving and more urbanized sound. With Little Walter, Waters’ guitar amp was louder and the men sometimes cut back and forth with talk-vocals. The instrumental hit “Evan’s Shuffle (Ebony Boogie),” recorded in October 1950, pointed where blues music was headed in Chicago. The tempo was faster, the playing was fiercer, and Walter’s harmonica solo was in a whole different range than older-style blues. Another key sideman was guitarist Jimmy Rogers, who first recorded with Waters in 1952. At the same time Rogers joined the Chess sessions, drums became a permanent fixture, and the style now commonly called electric blues was born. This was a far cry from Robert Johnson (or Son House, or Muddy Waters) bottle-necking an acoustic guitar at a Delta house party. This was loud, fast and intense, city blues for city people, tunes that leapt out of jukebox speakers and drowned out barroom chatter. Add in songs written by the slyly sophisticated Willie Dixon, and Muddy Waters got on the path he followed more or less for the rest of his career. Classics like “I’m Your Hoochie Coochie Man,” “I’m Ready” and “Mannish Boy” were recorded in this mid-50’s period. But wait, this only covers the first half of the collection. There is much more to enjoy, because those Willie Dixon tunes are almost all classics, still covered by blues bands big and small all over the world, every day. This is the blues canon, pure and simple, influencing all blues, rock, soul and other related music from those long-ago sessions forward. The classic “You Shook Me” is near the end of this chronological (by release number) collection. Alas, these CDs do not offer the best sound quality. You get what you pay for, because they are priced far below recent deluxe box sets from Chess’s current owner, Universal Music (for instance the lavish Howlin’ Wolf box set I reviewed last year). This material is out of copyright in the UK, where Acrobat Music is based. So the producers could gather up CD rips, old records and other sources to cobble together their compilation. At least that’s what it sounds like they did. Levels vary, digital processing artifacts abound, groove distortion from old 45’s and 78’s is clearly audible at times. But, as testament to the power of his music, Muddy Waters shines through. It’s easy to listen beyond the audio issues and let the music do its work. And again, at this price, it’s hard to expect much else. To the producers’ credit, there’s a decent booklet essay (perhaps taking harsher than necessary hindsight swipes at the Chess brothers) and a discography of sorts, cribbed from “The Complete Muddy Waters Discography” by Phil Wright and Fred Rathwell. As bargain-priced not-by-the-owner compilations go, this one is definitely a winner. Hopefully, it will inspire UMG to go back to their vaults and put out the complete Muddy Waters Chess catalog with shiny new remastering and better documentation. In any case, fans of the electric blues will get hours of enjoyment from these four CDs, and have some extra beer money left in their pocket.